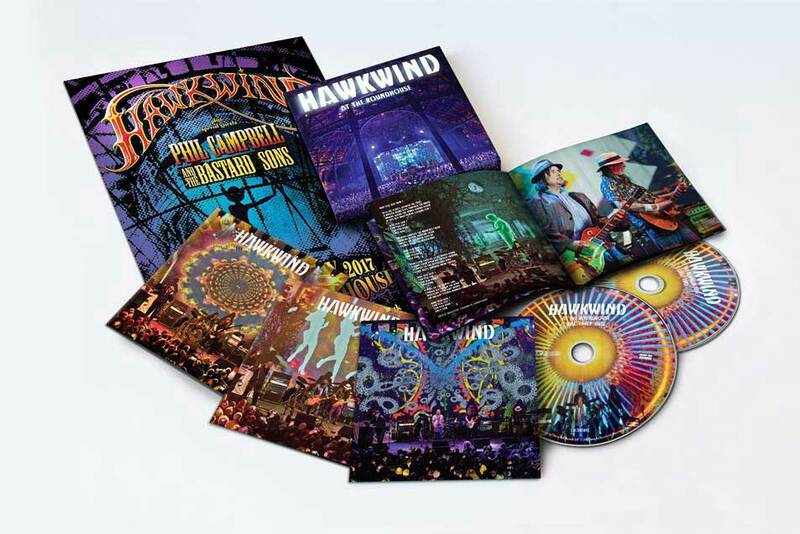 Hawkwind are back with another live release. This was recorded live at the Roundhouse in London on their In The Woods tour in 2017. It was the first time the band played at the Roundhouse since 1977 (Motörhead was the support act!). This special edition comes in a cool box with two CDs, a DVD and a nice booklet. The set is a real mix of new and old songs, showing a band that is continuing to move forward and not just playing their old 1970s material, which makes 11 of the 20 tracks. The band has a new lineup with Niall no longer with them. Jez and Tim are also gone. They have fresh blood with young Haz on bass, Magnus Martin on synths & guitar, and Michal on sax (from Poland). Dave, Dibs and Richard are the core of the band. It is a strong set and I enjoyed it quite a lot but I really miss some old school analog space sounds on the older tracks. Dibs has a computer and sometimes kicks out some pre-recorded sounds and Magnus plays some organ, but it doesn’t sound like old school electronics. A few tracks have prerecorded vocals and guitar that the band play over the top like for instance “Vegan Lunch.” A bit strange. Dave is great on the guitar, but the guitar is sadly mixed way too low. No balls to the guitar at all. It sounds like he is in the other room… The DVD is just one camera straight on with not a very high resolution. It is good enough to capture the amazing visuals but still can be a bit fuzzy. Overall, a solid release. The rhythm section of Dave, Richard and Haz is excellent throughout.